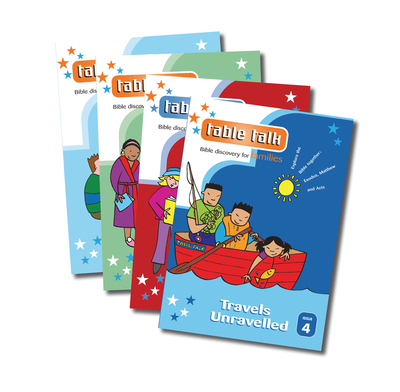 A year's subscription (four issues) to Table Talk, our book of daily Bible times for families or groups to use together. A year's subscription (four issues) to Table Talk, our book of daily Bible times for families or groups to use together. Based on just a few verses from the passage that XTB uses, it is suitable with children aged from 4 upwards. It forms the basis for a short family Bible time. Subscribe now and you will be offered the Explore Prayer Diary at the special price of $4.99 at the checkout. We have loved table talk. My eldest says it’s a fun way to learn about God. We will definitely be purchasing more in the series! We are a new Christian family and I wanted something that was easy do with my boys aged 8 and 10, without it being too complicated. The activities and prayers are great at the end. Highly recommend it. This is such a good book! After the emails over easter I wanted a book to carry on bible time with my children. These are easy to follow and do not take much time but my children (10 and 6) really enjoy this time together! Will be buying the whole set! I was recommended this book by our church's children's and young families worker because I wanted something that my 11 year old son could be interested in alongside my daughter also. It's a brilliant book and easy to use and the whole family including my husband got involved in it and as a whole family we all enjoy using it. We do it round the dining table when we have our tea as that's the best time for us all to be together. I'd recommend it for the family and my 11 year old son is really enjoying it too. We're trying Table Talk as a family at weekend breakfasts. It works well with parents leading it, and children answering questions and discussing points. We're using it with a 10 year old and a 4 year old. Extremely helpful in getting us together to read the Bible. Games are great to practically learn what is being taught. Not too heavy with just the right amount to keep everyone's attention & if the adults are honest the brevity helps their memories too!